Prepare for a SOGGY Christmas for us in Reigate! 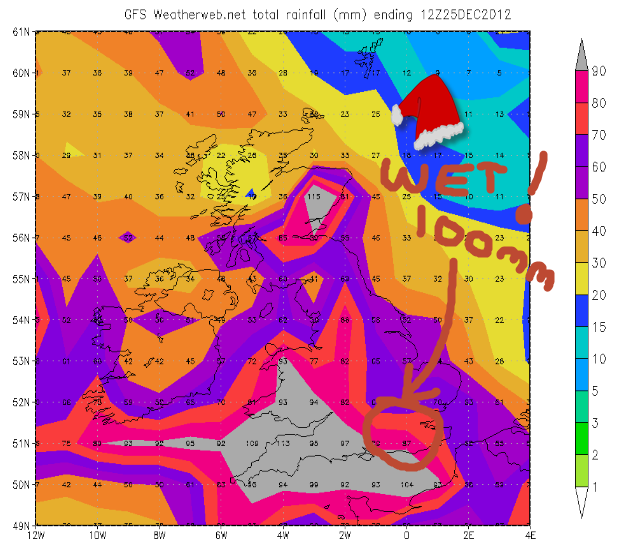 In fact, we could get a whopping 100mm (forecast update Tuesday suggests up to 70mm – a lot still!) of rain between now and finishing the turkey on Christmas Day. This is approaching the TOTAL rainfall we had in Reigate during the entire month of November (79mm) … expected in the next week! Reason: a big LOW pressure sits out in the Atlantic for the entire period, barely moving, but holding our position on the “left exit region” of the jetstream which will give birth to several vigorous baby depressions. These depressions will INTENSIFY (falling pressure , causing stronger winds and more rainfall) as they move across the UK. Rain is expected in Reigate on Wednesday pm, HEAVY rain Thursday am, Friday will be a respite before a wet weekend heralds a really wet Christmas (update Tuesday: cooler and dry for Xmas Day). AFTER the festivities there are signs of a prompt cooling off period for us all. Meanwhile, think of people in Russia – temperatures there are down to -30C at least!